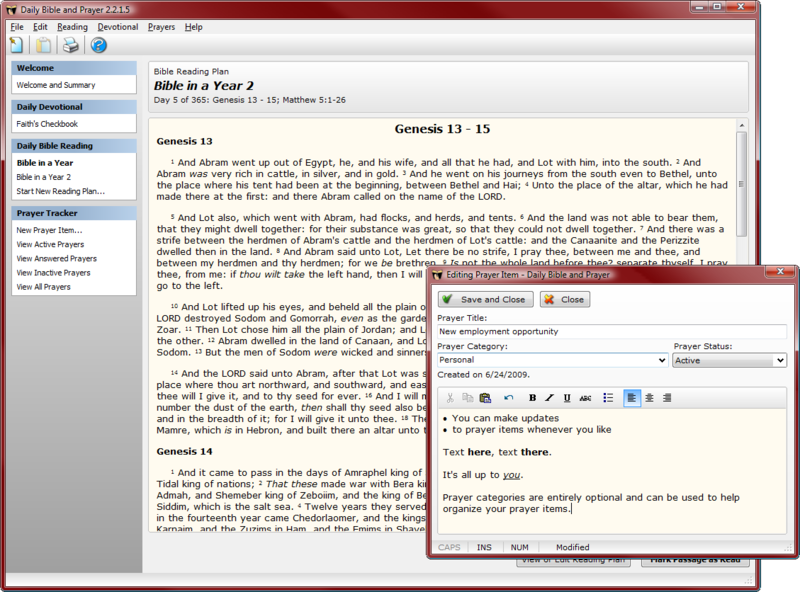 Free software for managing your Bible reading plans, prayer list, and daily devotional. Free software to manage your daily Bible reading, devotional, and prayer list. For Windows 7, Windows Vista, and Windows XP. For a complete Bible study library, be sure to consider SwordSearcher, featuring numerous resources and unique features. Over 100 commentaries, dictionaries, topical guides, and books. SwordSearcher features powerful searching and many useful time-saving tools, pop-up verse referencing, pop-up Strong's Greek & Hebrew definitions, Topic Guide, "Deep Referencing" which links all relevant material to verses, and more. Over 1 million cross references combined. Try SwordSearcher today. Daily Bible and Prayer requires Windows 10, 8, 7, Vista, or XP. Scipture quotations are from the Authorized King James Bible. Postal: PO Box 140478, Broken Arrow, OK 74014, USA.